As if by magic, after several days of light winds, tradewinds with 22 or more in the gusts materialised in the start area off English Harbour, to launch the RORC Caribbean 600 fleet off on the race course. First off were the 'smaller' boats. Piet Vroon’s electric blue Ker 46 Tonnerre de Breskens seared through the line on port like a guided missile. The Army Association’s A 40, British Soldier, sprang into action, stealing a march on the competition in IRC Two and Tony Lawson’s Class 40 Concise nailed the middle of the line to lead their class. Ten minutes later, the line off Fort Charlotte was festooned with canvas, as the 155ft schooner Windrose of Amsterdam came in on port at the pin end with amazing power while Peter Harrison’s Farr 114 Sojana opted for a middle of the line start and engaged Brian Benjamin’s Carbon Ocean 82, Aegir, which was right in under the Pillars of Hercules. Sojana then tacked into Windrose’s path, but thankfully there was no issue. But it was Simonas Steponavicius’ Volvo 60, Ambersail that stole the line, taking a flyer on port. The Lithuanian team with veteran Volvo Ocean Race sailor Magnus Olsson on board, got away in clear air to lead their class at the start. No doubt, the amateur crew would have been welling up with pride and adrenalin, having pulled off the best start of the race. Next up was the big showdown between the canting maxis and there was drama even before the start. Inside the 10 minute gun, on Hugo Stenbeck's Dubois 90 Genuine Risk, there was a sickening crack as the vang pulled clean out of its deck mounting: the team had no choice but to return to the dock. Meanwhile Mike Slade’s ICAP Leopard and George David’s Rambler 100 were getting on with big business. This is the first ever show down between two of the fastest monohulls in the world. ICAP Leopard came smoking in on port from course side, Rambler chose starboard under the cliffs. ICAP Leopard may have thought they were too early and tacked onto port, just before the line, while Rambler 100 wound up the canting keel flyer under the cliffs off Fort Charlotte. But it was Adrian Lee’s Cookson 50 Lee Overlay Partners that judged the line to perfection. 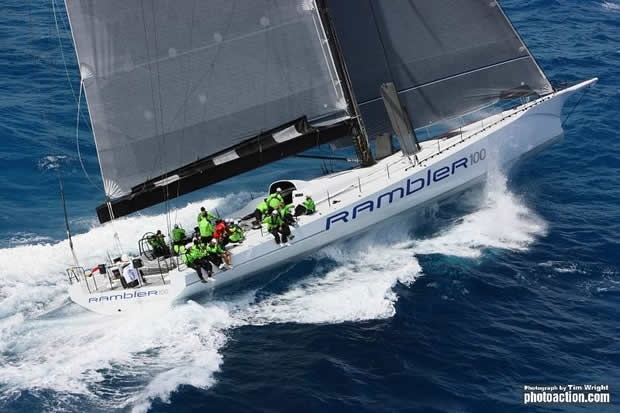 However, as expected they were quickly rolled by Rambler 100, who rounded Green Island in no time at all, powering down the windward side of Antigua, at over 20 knots towards Barbuda. Last to start were the multihulls. There may be only two of them this year, but that didn’t stop Cam Lewis from match racing at the start on Lloyd Thornburg's Gunboat 66, Phaedo who turned Wonderful about in a pre-start dial up.